Introducing the ultimate in screen protection for the Huawei Mate 20 Pro, the 3D Glass by Eiger is made from premium real glass with rounded edging and anti-shatter film. Glass screen protectors have always been a nightmare for phones with curved screens. Previously I had opted for the film screen protector as it adheres to curved screens better. It's safe to say that having taken the risk of buying a glass one for more protection, this one turns out to be good! I'd like to thank Mobile Fun for their speedy delivery and Eiger for their quality protector. 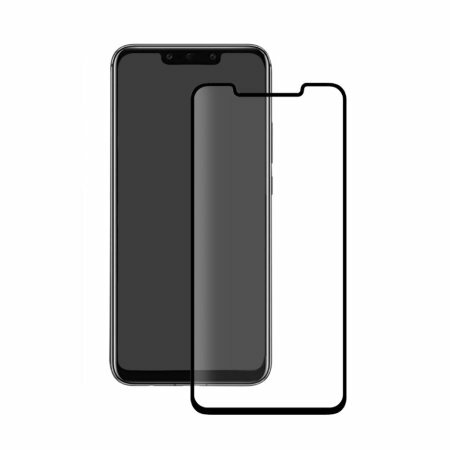 My only issue is that the notch cut-out is a little bigger than the Mate 20 Pro's notch (by a hair), and the sides of the screen are ever so slightly clipped by the protector itself. Both issues are easily forgotten. Other than these, I can't complain! As good as it's going to get! I'm impressed with the quality of the screen. In short, it's a decent stab at a tough job - trying to adequately protect a curved glass edge - which isn't easily protectable! When I bought the phone and started looking for screen protectors I quickly realised there weren't many options out there. I didn't want to physically glue anything to my phone screen as appears to be the only other option to this (you'd have to be mad to want to do this). The problem is that when my wife dropped her phone the other day this screen protector came off. On mine (we both have the Mate 20 Pro) the screen protector hasn't fallen off, but because it doesn't nit perfectly to the screen like a screen protector on a non-curved screen does, dust has got under the bottom edge. This is probably because I was perhaps half a millimetre out when I located it in the first place. Practice makes perfect though, and with my wife's replacement cover I located it more accurately, and realised that you can very gently readjust it once it's in place. Overall a pretty decent product, and the flaws of it are because of the screen it's got to stick to, not with the product itself. This screen protector is a great bit of kit that looks part of the phone screen. It feels silky smooth yet at the same time quite robust. There are 2 "problems" unfortunately...firstly it will not allow the phone to recognise finger prints but there is always the front camera unlock facility which is lightning fast. The second is it will not recognise double knock for screen shot but there is the drop down menu. Great cover and great service! Brilliant case - went on really easily without air bubbles which has often been a frustration with previous cases. Awesome service too! Chose Eiger over Panzer Glass as heard negative reviews on the latter. Very glad I did. Instructions are easy and you can tell its a quality glass protector. Fits very well indeed. Recommended. Finger print scanner works well. Easy to fit. 5 starts so far. Had a different brand that cracked not long after fitting so hoping this one will be better, finger print scanner didn't work so well on that one either. The black strip around the edge is the only part that sticks to the screen. In my case part became unstuck and let in some dust so I had to clean it and have another go after a few days. The black strip also obscures some of the screen at the sides. It fits the screen well though. Decent cut and shape for the curved edges of the phone which is a great success. Doesn't seem to adhere very well and there for the edges are beginning to let dust in. Would buy again in the hope that I have applied it wrong (although I don't think I have) as a nice product other than that and would be fearful another brand might not fit so well. It fits my phone very well and left no bubbles on application. It's now been on a few days and it looks great with excellent protection as I dropped my phone from quite a height and it didn't shatter. Its so bulky and thick that built in fingertip sensor is not working at all. They claim it's working but actually it's not. Too bad. Otherwise fits screenshots very good.